Rep. Alexandria Ocasio-Cortez (D-N.Y.) and Sen. Ed Markey (D-Mass.) have released an overview for their "Green New Deal" to save the environment. Among other liberal wish-list items, the plan calls on the United States to "upgrade or replace every building in US for state-of-the-art energy efficiency" and admits that every "billionaire and company" could not pick up the price tag for such an endeavor. The Green New Deal suggests making sweeping — and very pricey — changes to U.S. infrastructure. These include having the country "upgrade or replace every building in U.S. for state-of-the-art energy efficiency." The plan does not mention an estimate for the carbon footprint of such an endeavor. As a separate bullet point from upgrading every building, the Green New Deal would "repair and upgrade U.S. infrastructure." The document states estimates that it will cost "$4.6 trillion at minimum." But wait, there's more. The plan called for a massive overhaul of the U.S. transportation system. In addition to phasing out all fossil fuels and airplanes, the deal would also get rid of nuclear power. "It's unclear if we will be able to decommission every nuclear plant within 10 years," the plan states, "but the plan is to transition off of nuclear and all fossil fuels as soon as possible." When it's not cleaning up the environment, the Green New Deal would also solve poverty by creating "millions of high-wage jobs and ensure prosperity and economic security for all." It would also provide "economic security for all who are unable or unwilling to work"
The biggest winners of the deal? Labor unions. This deal would "create millions of family supporting-wage, union jobs" and would require "that all [Green New Deal] jobs are union jobs that pay prevailing wages and hire local." But who would pay for this massive undertaking? The Federal Reserve can extend credit to power these projects and investments and new public banks can be created to extend credit. There is also space for the government to take an equity stake in projects to get a return on investment. At the end of the day, this is an investment in our economy that should grow our wealth as a nation, so the question isn't how will we pay for it, but what will we do with our new shared prosperity. These plans to dramatically overhaul U.S. infrastructure, transportation practices, and the economy would take place over a decade. According to the release, the U.S. must "get to 0 [carbon emissions] by 2030." The speed of investment required will be massive. Even if all the billionaires and companies could make the investments required, they would not be able to pull together a coordinated response in the narrow window of time required to jump-start major new projects and major new economic sectors. Because of this, the government would have to step in and take control. The report says that "the level of investment required will need every actor to pitch in and ... the government is best placed to be the prime driver." Despite the claim in the Ocasio-Cortez/Markey release that "92 percent of Democrats and 64 percent of Republicans support the Green New Deal," Speaker of the House Rep. Nancy Pelosi (D-Calif.) seemed wary of openly supporting it. On Thursday, Pelosi named eight Democratic members of Congress to the Select Committee on the Climate Crisis, including three freshmen. 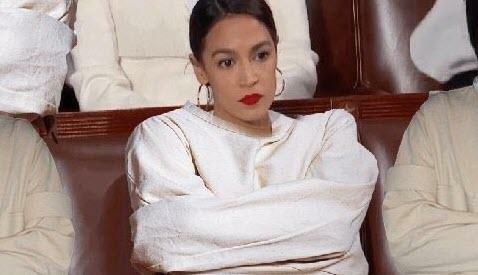 Notably, Ocasio-Cortez was not one of those freshmen. When Politico asked Pelosi whether or not the committee would be focusing on the Green New Deal, she dismissed the idea. "It will be one of several or maybe many suggestions that we receive," she said. "The green dream or whatever they call it, nobody knows what it is, but they're for it, right?" 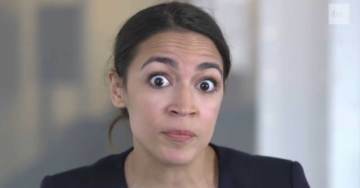 “Expanding high-speed rail to ‘a scale where air travel stops becoming necessary’"
Democrat darling Alexandria Ocasio-Cortez released information on the Democrat Party’s radical and lunatic Green New Deal on Thursday. The radical Democrat-Socialist plan will destroy the country in months… if not days. The plan ends air travel with ocean bridges, ends traditional forms of energy, destroys the US energy sector, ends nuclear energy, mandates all new jobs must be unionized and gives free money for not working. That’s just part of it. They also want to get rid of farting cows. Americans for Tax Reform posted details to the plan. The plan did not go over well. And already the plan was taken down. The Green New Deal Plan was pulled from Ocasio Cortez webpage today. 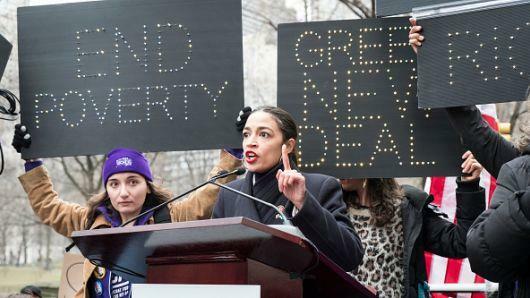 More… Apparently Ocasio-Cortez’s green plan was littered with typos! 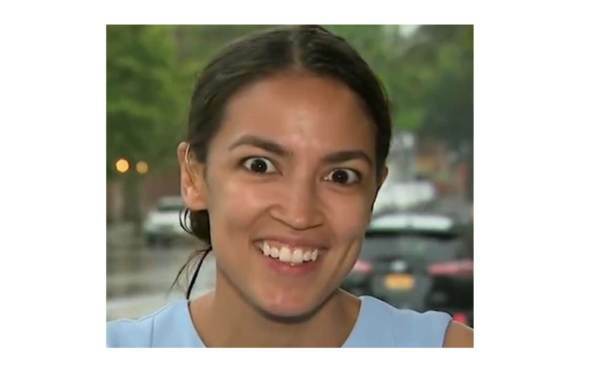 It appears Ocasio-Cortez is successfully dragging the Democrat Party further to the left, and away from any semblance of sanity. Democrat presidential hopefuls Cory Booker, Elizabeth Warren, Kamala Harris, and Kirsten Gillibrand publicly endorsed U.S. Representative Alexandria Ocasio-Cortez’s radical ‘Green New Deal’, which would require rebuilding every building in the United States. Eager to please the new Democrat firebrand, several Democrat Presidential candidates have already endorsed Ocasio-Cortez’s radical ‘Green New Deal’, which she claims would pay for itself. Absent from their endorsement was any mention of the staggering cost of rebuilding or “upgrading” every building in the United States to become compliant with the proposed legislation. While Ocasio-Cortez has claimed the bill would pay for itself, there is no mention to the potentially astronomical cost of rebuilding or “upgrading” all existing buildings. In New York City’s Manhattan alone, there are 60,000 individual buildings, and government estimates suggest there are 5.7 million commercial buildings throughout the United States. The vast majority of these buildings would likely not meet Ocasio-Cortez’s standards. 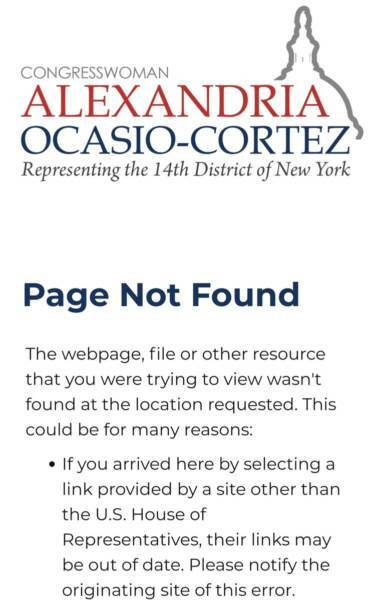 Ocasio-Cortez deletes "Green New Deal" documents from her website when people realize how CRAZY her plan really is!! "Guarantee a job with a family-sustaining wage, adequate family and medical leave, paid vacations, and retirement security to all people of the United States"
"The Green New Deal encapsulates everything Americans fear from government, all in one bonkers resolution..."
"By the end of the Green New Deal resolution (and accompanying fact sheet) I was laughing so hard I nearly cried. If a bunch of GOPers plotted to forge a fake Democratic bill showing how bonkers the party is, they could not have done a better job. It is beautiful. " " The Republican Party has a secret weapon for 2020. It’s especially effective because it’s stealthy: The Democrats seem oblivious to its power. And the GOP needn’t lift a finger for it to work. All Republicans have to do is sit back and watch 29-year-old Rep. Alexandria Ocasio-Cortez . . . exist." Buried in the details, the Green New Deal also promises government control of the most fundamental aspects of private life. The fact sheet explains why the resolution doesn’t call for “banning fossil fuels” or for “zero” emissions across the entire economy—at least at first. It’s because “we aren’t sure that we’ll be able to fully get rid of farting cows and airplanes that fast” (emphasis mine). This is an acknowledgment that planes don’t run on anything but fossil fuel. No jet fuel, no trips to see granny. It’s also an acknowledgment that livestock produce methane, which has led climate alarmists to engage in “meatless Mondays.” AOC may not prove able to eradicate “fully” every family Christmas or strip of bacon in a decade, but that’s the goal. ...the resolution is Democratic math at its best. It leaves out a price tag, and is equally vague on what kind of taxes would be needed to cover the cost. But it would run to tens of trillions of dollars. The fact sheet asserts the cost shouldn’t worry anyone, since the Federal Reserve can just “extend credit” to these projects! And “new public banks can be created to extend credit,” too! And Americans will get lots of “shared prosperity” from their “investments.” À la Solyndra. At least some Democrats seem to be aware of what a danger this is, which is why Ms. Pelosi threw some cold water on the Green New Deal this week. They should be scared. Ms. Ocasio-Cortez is a freight train gaining speed by the day—and helping Republicans with every passing minute. Want to know why Alexandria Cortez wants a 70 percent tax to fund her Green New Deal? Alexandria Ocasio-Cortez: Medicare for all.